The Intel® SSD E 6100p Series combines high PCIe* performance with Intel® 3D NAND Technology to deliver twice the performance than the previous generation – the Intel® SSD E 6000p Series. 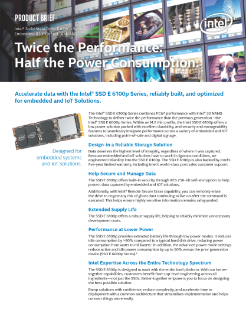 Within an M.2 thin profile, the Intel® SSD E 6100p Series oﬀers a low power solution packed with excellent durability, security, and manageability features to seamlessly integrate performance across a variety of ...embedded and IoT solutions, including point-of-sale and digital signage. Data deserves the highest level of integrity, regardless of where it was captured. Because embedded and IoT solutions have to work in rigorous conditions, we engineered reliability into the SSD E 6100p. The SSD E 6100p is also backed by Intel's five-year limited warranty, including Intel's world-class post sales customer support. The SSD E 6100p oﬀers built-in security through AES 256-bit self-encryption to help protect data captured by embedded and IoT solutions. Additionally, with Intel® Remote Secure Erase (Intel® RSE), you can remotely erase the drive to negate any risk of ghost data continuing to live on after the command is executed. This helps ensure highly sensitive information remains safeguarded. Un nuevo enfoque hacia el almacenamiento de la nube ha permitido a Yahoo controlar los costes, gestionar el almacenamiento y mejorar las experiencias de los usuarios. Descubra las características y ventajas de los discos duros de estado sólido Intel® SSD DC serie D3700 e Intel® SSD DC serie D3600. A low latency, high efficiency solution that works right out of the box to support more users and more data. Use this tool to compare multiple data centers, and generate real data to determine what product best suits your workload. Informe de Principled Technologies: Impulse el trabajo de sus clientes con hardware de Intel.